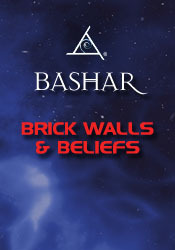 During this phase of this amazing weekend experience, Bashar first takes us deep into the process of transforming stubborn and resistant subconscious beliefs that prevent us from experiencing our full self empowerment and then follows in the afternoon with a GUIDED MEDITATION while viewing the Holotope, that anchors the changes in our consciousness and must be experienced to truly appreciate! Sometimes when I do core belief meditations I start to feel sick and have to stop. Why? Why isn’t my manifestation coming to fruition? Is there a question I can ask myself? Is that a state I can put myself into? You talked about Step 1, intention, focus, concentration. Step 2 was absolutely letting go and surrendering. Is action Step 3? You refer to the negative and the positive beliefs, but particularly the negative, almost as a self-aware entity that has an intelligence and a bag of tricks. Could you expand on that a little bit? What about limiting core beliefs that are fundamentally neutral, like gravity? Sometimes I’m excited about a few different options. Which one should I pick? I’ve heard you explain the idea that that child is actually taking in part, some of the beliefs telepathically from their parents. Are we stuck working through our parents’ negative beliefs from the very beginning? Is part of the karmic contract that the child helps the parent heal this? What about Indigo Children and how we relate to our parents? Can negative beliefs turn into physical ailments? I’ve become almost homeless following my excitement. What am I doing wrong? I think it was Thoreau who said the majority of men lead lives of quiet desperation. I’m wondering as you are able to peruse the planet, what’s the percentage right now that is locked into a negative state? Are we in a time of flushing out the negative? Is there a collective unconscious belief about money? How can we align ourselves with a more positive core belief about money to assist all of us towards more abundance right now collectively? You talked about paradox, and I’ve found it to be a tremendous form of alchemy. Can you talk more about that? Should I trust myself? Am I communicating with my higher self?